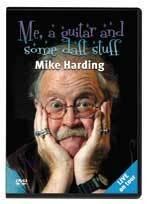 Good news for all Mike’s legion of fans is that his current tour of ME, A GUITAR AND SOME DAFT STUFF is being filmed for a 90-minute DVD which will be available in time for Christmas. Filming takes place at the Theatre Royal, Wakefield, on Saturday November 19 and copies will be available in early December. Included in the performance will be some of Mike’s all-time greats, such as Uncle Joe’s Mint Balls, My Brudda Sylveste, Manuel, Rosy-Cheeked Girls and The Ballad of Cowheel Lou.